BMW 5-Series 2016: the effect of restyling. The decision to release the next version of the BMW 5-series was made in the company due to a sufficiently high level of competition in this segment of the car market. Presentation of the new product is to improve the company’s position in the global automotive community. Now engineers are working hard to create a conceptually new product. The updated model will be built in the Touring Car performance F10 on the basis of a modular platform OKL. In the future, this is the basis to be used for the construction of models of the fifth series. It is also assumed that the BMW X6 will odnoplatformennikom all of these new products. The new BMW 5 Series 2016 model year will be available in a variety of body designs. Motorists will be able to choose between a hatchback, station wagon, the traditional sedan and GT. The use of composite materials for the body of the device allowed to minimize the weight of the vehicle performance. The new car will be lighter than its predecessor, at least 80 kg. As a result, the speed potential of the model will tend to increase. You should also focus on the fact that reducing fuel consumption. Maximum efficiency of the new BMW should attract the attention of a large number of potential buyers. A wide range of power units allows you to choose the best option. Let’s look at each of the available versions. 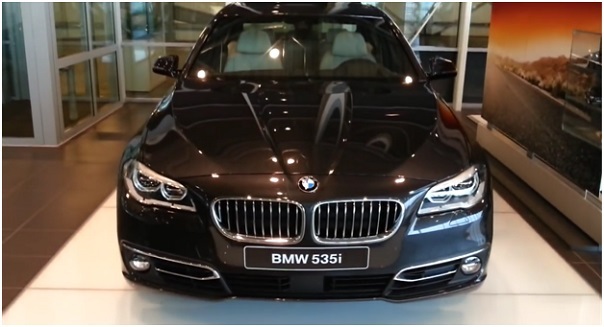 • Motorists are also offered the opportunity to purchase the BMW 5-series 2016, equipped with a hybrid engine. The electric motor is able to replenish the supply of container from ordinary household outlet. Subject to the use of such a unit fuel consumption drops to 4 liters per 100 km. • A special place in the line takes a three-liter diesel engine plant with three turbines. With a maximum torque of 740 Nm of this engine is capable of producing 381 hp power In the near future, this engine is to undergo modernization. In this scenario, the engine can accelerate to 100 km / h in just 4.5 seconds. Engines will work with six mechanics and nine-automatic transmission. For the domestic car market will be relevant only to those models that are equipped with an automatic transmission. A characteristic feature of the new car can be called that in the top configuration model will be equipped with all-wheel drive system xDrive. It is expected that the new BMW 5-series will go to the official dealers in the second half of 2016. In this scenario, an improved version of the model, equipped with all-wheel drive will be on the market early in 2017. Earlier in the rest of the public will be in the car touring car performance sedan. After him come the five-door hatchback and station wagon. This car will have to compete with the popular Mercedes-Benz E-class and Audi A6. The cost of new items will be officially announced closer to the start of sales. Dorestaylingovoy version of the BMW 5-series, available on the market today, will cost a potential buyer from 1,825,000 to 2,650,000 rubles.